Mr. Atterholt offered an opening statement in which he introduced himself and then answered the question he was sure was on the Committee’s collective mind: Why did he want to return to the IURC in 2017 having already served on the Commission from 2009 to 2014, including as Chair for three-plus years? Mr. Atterholt’s answer to his own question was that he had greatly enjoyed his previous public service on the Commission, believed he had made a positive difference during that service, accepted the position of Gov. Pence’s Chief of Staff only because the Governor had asked him to do so, and when he looked at what he wanted to do going forward, serving again at the Commission was where he felt he would both be happiest and be able to do the most for the citizens of Indiana. Without summarizing it but inviting questions, he referred to his very detailed application (not posted on the IURC NC website yet that I can find) for what he believed were his contributions while serving at the Commission, as well as during his time in the General Assembly, at the Department of Insurance, and as Chief of Staff. 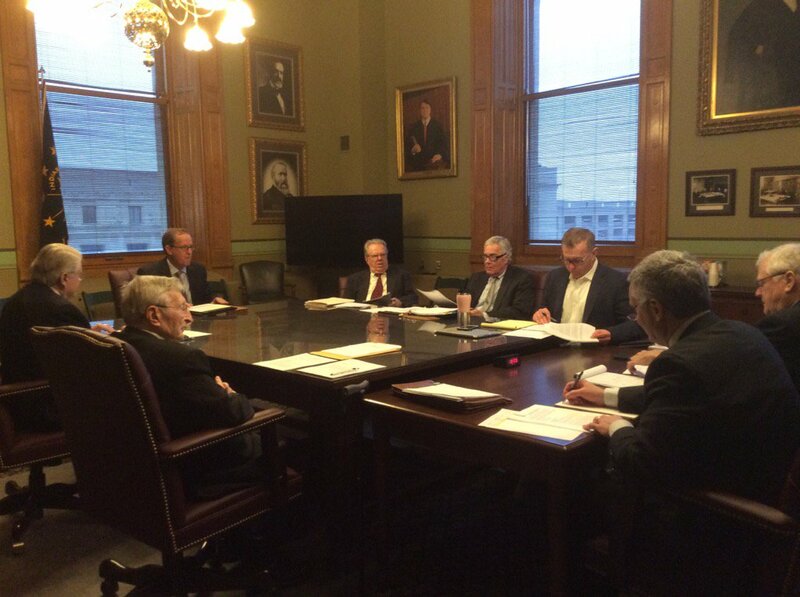 While he responded to several questions from Committee members, the responses most relevant to Indiana DG members probably came in two separate exchanges with Committee member Michael Mullett. In the first, Mr. Mullett cited his view as a long-time attorney in the utility regulatory process and an adjunct faculty member teaching Public Utility Regulation and Deregulation that the production, transmission, distribution of sale of electricity at the retail level was no longer a so-called “natural monopoly.” He also cited the Commission’s current statutory authority to approve alternative regulation or even deregulation for electric utilities previously subject to traditional regulation as vertically-integrated monopolies. He then asked Mr. Atterholt his views, looking forward, regarding new business models and regulatory paradigms developing in the electric industry, much as they had earlier developed in the telecommunications industry. Mr. Atterholt responded that while he was philosophically in favor of the trend toward deregulation of previously regulated industries when technological advances and market developments supported it, he was still skeptical that the Indiana electric utility industry was at a point where a transition to competition and deregulation similar to that which had taken place in the telecommunications industry would be desirable or feasible in the foreseeable future. He said that the availability of fracked gas at historically low prices and its expanded use for electric generation had dramatically changed the cost structure of the industry, resulting in shifting significant generation from coal to gas. He also stated that gas generation emitting only about half the CO2 emissions as coal generation had contributed to that shift. And, he thought that wind generation had really taken off in northern Indiana lately to become a significant renewable generation source. But, he thought solar generation was still too expensive to be a second major renewable generation source, although it could become one if its declining cost trend continued. Overall, he believed that the major constraint on both wind and solar was their intermittent nature, which could only be overcome by deployment of significant electricity storage facilities, especially large batteries, like the one which IPL had recently deployed here in Indianapolis on something of an experimental basis. So, he envisioned an extended period during which gas generation would serve as a bridge to renewable sources like wind and solar. During that transition period, he expected that the traditional business and regulatory models for utilities would continue to apply, especially in states like Indiana. Mr. Mullett followed up with a question about how Mr. Atterholt felt about the Midwest Independent System Operator and its wholesale market mechanisms. Mr. Atterholt indicated that he was a big fan, very enthusiastic about MISO and similar Regional Transmission Organizations or RTOs around the country and the transformation they had brought to the wholesale market for electricity, including here in Indiana. But, he expressed skepticism that “Open Access Distribution” at the retail level analogous to the “Open Access Transmission” which RTOs had brought to the wholesale level would develop here in Indiana any time soon. In the first place, Mr. Atterholt read the results of prior efforts at competition and deregulation at the retail level in other states to be mixed, with unresolved issues relating both to service reliability and price stability. He was especially concerned about whether these regimes provided sufficient economic incentives for the construction of enough new capacity to meet future needs for electricity reliably and affordably. In the second place, Mr. Atterholt saw the situation here in Indiana as one where the utilities simply had too much investment in their own existing generation sources to make a rapid, large-scale transition to newer, cleaner sources owned by others, whether customers or competing electricity suppliers. Mr. Mullett also asked Mr. Atterholt about the Indianapolis Star article from August 2011 headlined “Too Close for Comfort,” which had reported that he had had several communications with Duke Energy officials which posed ethics questions leading up to the scandal which engulfed several former Commission officials, including former Chair David Hardy, former Chief Administative Law Judge Scott Storms, and former Executive Director Mike Reed, as well as former Duke Energy Executive Vice President Jim Turner. Highlighted in the Star article had been an e-mail from April 2010 in which Mr. Atterholt had recommended a long-time Duke Energy lobbyist, Julie Griffith, to become President of Duke Energy Indiana. In the event, the Company had appointed Mr. Reed instead. Mr. Atterholt explained that, with 20-20 hindsight, he would not have sent the e-mail recommending Ms. Griffith. But, at the time, be believed that it was important to signal Duke that not everyone on the Commission was backing Mr. Hardy’s effort to have Mr. Reed appointed. He believed this was important because Mr. Hardy had been a bad Chairman for the Commission, rewarding people he liked and who supported him while punishing people he did not like or had crossed him. This had really affected Commission morale. He mentioned by name former Commissioners Greg Server and Jeff Golz in that context. In the end, Mr. Atterholt said, the Governor fired Mr. Hardy as Chair and appointed Mr. Atterholt to replace him. And, Mr. Atterholt felt that he had provided new leadership and implemented reforms that had addressed the problems which had resulted in the scandal. In this regard, Mr. Atterholt mentioned specifically separating the positions of General Counsel and Chief Administrative Law Judge so as to better protect the Commission’s decision-making in contested cases from the potential influence of ex parte communications. He also mentioned noticed public meetings with utility officials and representatives of other interests involved in the regulatory process as a reform addressing the risk of undue influence. Finally, he mentioned making sure that the expenses of conferences and other events which the Commission sponsored or its members and employees attended be paid for by the Commission from funding sources other than the utilities they regulate. He said he was proud of these reforms he had implemented during his time as Chair and pleased that his successor had continued them. NOTE: Time permitting brief summaries of the other three applicants will be shared in a later post.